It’s been one year. I began this blog in April 2011 and now that April 2012 has come to a close, I thought it’d be appropriate to look back at the past year and how far we (as a collective body of movie/television/game/culture enthusiasts) have come. The number one thing that I’m proud of is the amount of traffic this site has been getting. Most of this traffic comes from search engines hits, so many of you may have found us due to searching for your favorite movie or TV show. Others of you might know me personally, while some of you likely Facebook-stalk me (and that’s totally fine and actually encouraged). Wow. Nearly 50,000 views in a year. That’s mindblowing (to me, anyways). My busiest day was actually just a few days ago when I posted two reviews for Safe and The Raven, as well as the popular crash-course to prepare people for The Avengers. You can see a steady incline, except for December. I figured people were busy with shopping and holidays and family and didn’t have time to look up what some stranger thought about that new movie coming out. My guess. So, with that many views… What posts brought that sort of traffic? As you can see, the views are dominated by a few articles at the top. With a drastic lead, a humorous take on Mighty Morphin Power Rangers, which asks the important questions. In 2nd place though is the homepage for my blog, meaning people have either bookmarked or have clicked on the homepage after reading whatever article brought them to the site. This means a lot to me, as it’s more than just search results but actual reader interest. A lot of traffic also comes from people searching for their favorite Facebook games. 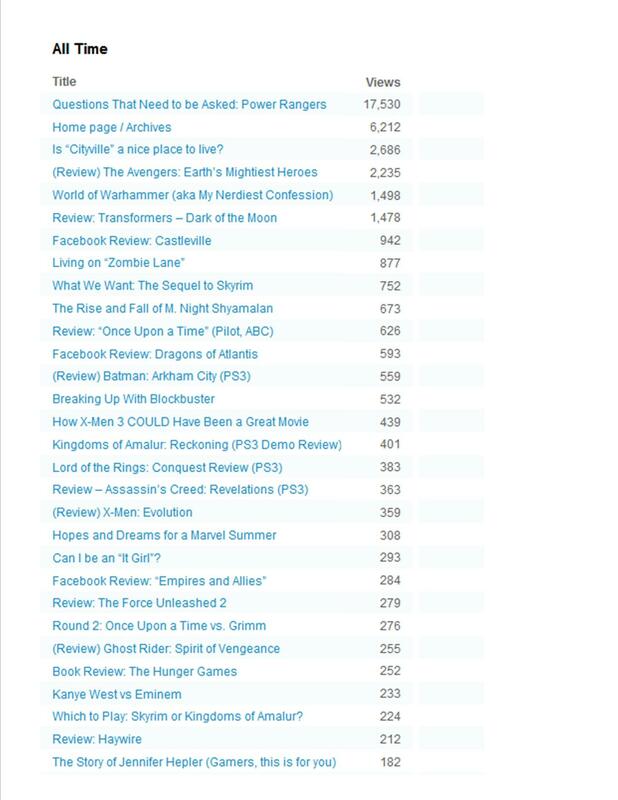 Reviews for Cityville, It Girl, Zombie Lane, Castleville, and more continually bring in major traffic. Articles You Should Catch Up On! In the past year, there have been a few articles I’m especially proud of. One of these looks at an incident at videogame developer BioWare involving a woman writer and a wildfire of (unfair and unwarranted) criticism from the internet. I’ve done three articles that look forward to the next games in a few franchises, so check out my thoughts on the next Dragon Age, Skyrim, and Assassin’s Creed (this last one cowritten by fellow blogger over at Spawn Camp). For movie fans, I looked at the history of movies like Hunger Games and what movies have served as stepping stones to that franchise. I looked forward and summarized what people “need to know” for both The Avengers and The Hobbit. And in a non-entertainment moment, I wrote a few of what I call “Adam’s Rules” which focus on what should be unspoken rules which clearly need speaking. These rules discuss both walking and riding shotgun, both controversial topics. I’m working on a “seeing a movie in theaters” rules outline next. What’s next for I Am Your Target Demographic? This next year will be big. I’m getting into my stride, mixing up television and movie reviews with some video game tidbits and working in some unique spins as well. With a big summer ahead, there will be plenty of Avengers vs Spiderman vs Dark Knight Rises articles I’m sure. Something to look forward to! So check out all the articles referenced above and let me know your thoughts! Make your goal today to comment on at least one! I don’t mind if you’re a stranger, you can even leave an anonymous comment! This entry was posted in Entertainment, Facebook, Gaming, Movies, TV and tagged adam ryen daniels, adam's rules, amazing fans, avengers, bioware, dark knight, hobbit, i am your target demographic, movie reviews, power rangers, superheroes, thank you, video games, year in review. Bookmark the permalink. Yeah, I haven’t really thought about that. Right now, it’s just fun! Maybe someday though… Good luck!